Born at Fawnspark, Abercorn Parish, WLN, Scotland in 1826, eldest son of James Barclay (1793-1877) and Elizabeth Bishop (1804-1888), he married Mary Goodess (1830-1870) on 10 July 1848 and their daughter Catherine Barclay (1848-?) was born later that year. In 1849, the family moved to New York City where he apprenticed as a carpenter and they had another daughter, Josephine Goodess Barclay (1852-1908). After completing his training, he moved to Hamilton, Ontario about 1853 then moved to Guelph to avoid a cholera outbreak. In 1866, he helped to repel Fenian invaders at Guelph as a member of the Guelph Battery of Garrison Artillery (now known as the 11th Field Artillery Regiment Royal Canadian Artillery) and was henceforth known as “Captain Barclay.” In Ontario, he had nine more children: Mary Goodess Barclay (1855-? 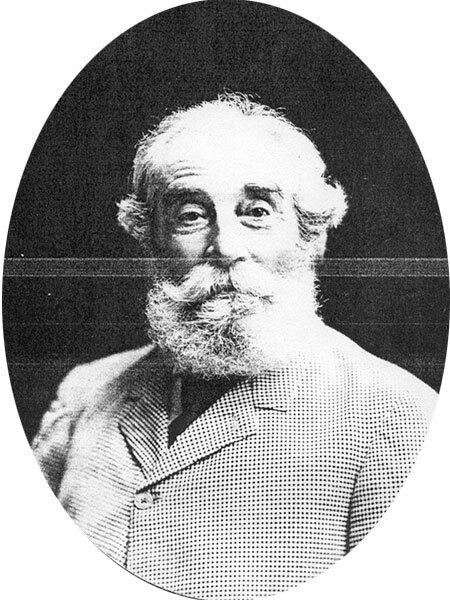 ), James Goodess Barclay (1856-1931), Elizabeth Lindsay Barclay (1858-1939, wife of James Stirton), Francis Bishop Barclay (1861-1895), Agnes Barclay (1862-1862), Roberta Barclay (1863-1938), Alfred Goodess Barclay (1865-1875), Williamina Grant Barclay (1867-? ), and Jane Barclay (1870-1870). On 21 November 1870, he married Mary Janet Stirton (1845-1907), a daughter of his friend, Guelph postmaster David Stirton. They had no additional children. He died at Blair, Ontario on 9 February 1912 and was buried with his first wife in the Woodlawn Cemetery at Guelph.